We take pride in being a true solutions provider, not just a typical software vendor. CourTNet’s software encapsulates adaptable business processes with user definable business rules to provide you with a comprehensive, easy to learn, browser-based court solutions. We strive to bring you high quality Information Technology Solutions that can run over the internet. Our flexible solutions allow you to run your office in a manner which best suits your county. We work to meet your specific needs and help your court reach the highest efficiency level, so that clerks can focus on providing outstanding customer service. CourTNet’s role does not end once the software is licensed; instead we continue to provide hands-on support. We personalize training and services to meet your need and form an on-going support network that allows you instant and easy access to help and technicians. Quickly you will realize we have become an integral part of your team. 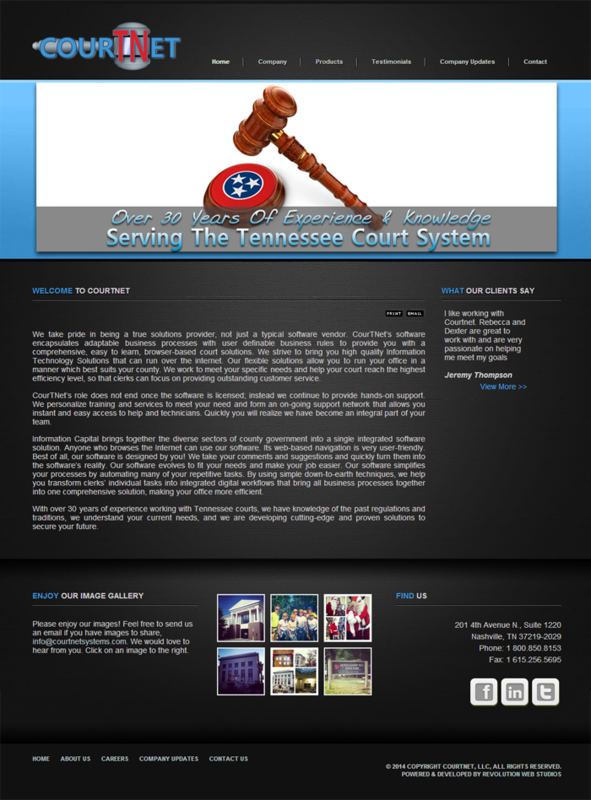 With over 30 years of experience working with Tennessee courts, we have knowledge of the past regulations and traditions, we understand your current needs, and we are developing cutting-edge and proven solutions to secure your future. To find out more information about CourTNet, click here.